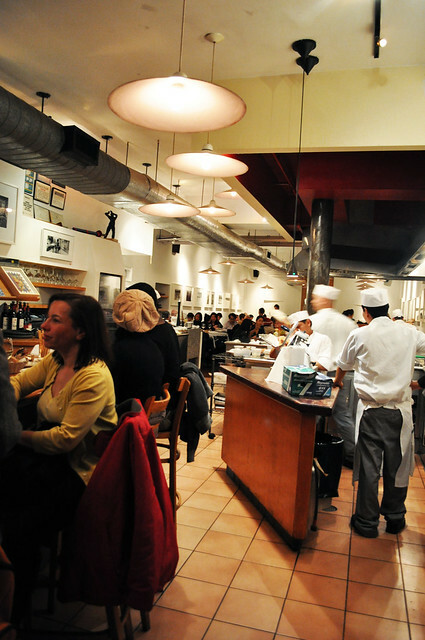 Date night a couple weeks ago included a visit to Basta Pasta near Union Square, a casual yet elegant restaurant where spirited, lively energy of Tokyo meets the rich flavors of Rome. 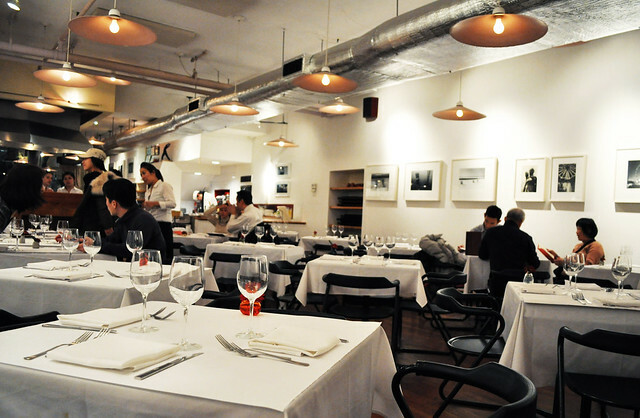 Basta Pasta was established back in 1985 over in Tokyo, designed after the cult TV program, "Iron Chef" -- i.e., the source of the restaurant's inspiration for its completely open kitchen concept to emulate (a) kitchen theatre. 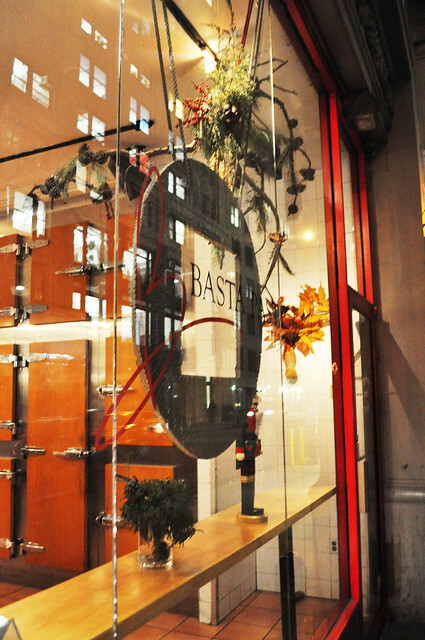 Five years later, Basta Pasta found another home in New York City, welcoming its guests "to enjoy Italian as the Japanese do" with the Japanese take on classic Italian cuisine. On the other side of the "kitchen stage" are seats available at the bar counter. What I love about the dining room at Basta Pasta was how clean cut and bright it all was -- certanly made for easy food snapping! It also allowed for the boldly colorful dishes pop. 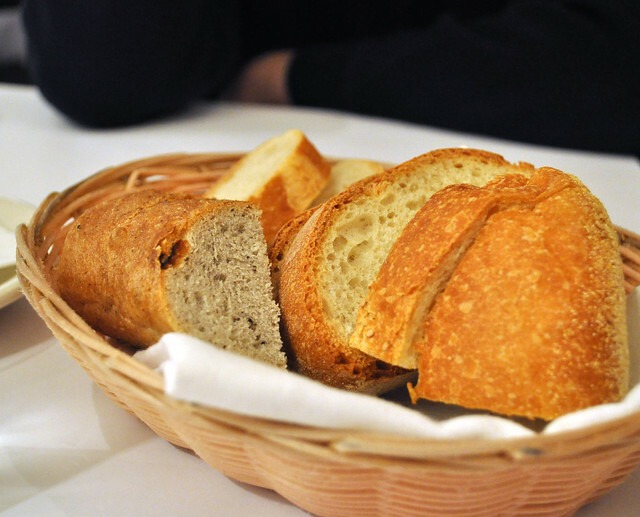 A bread basket with two kinds of bread . . .
. . . along with twisted breadsticks. To start, there was an obvious choice for us. The calamari alla griglia -- grilled squid with homemade stuffed sausage of curry risotto, golden raisins, pistachios, and prosciutto -- had our names written all over it. As the ingredients of squid, risotto pistachios, and prosciutto rolled off my tongue, Marcus simply interjected, "Yes, yes, yes! Let's order it!" I remember thinking to myself, Wow, that was easy! 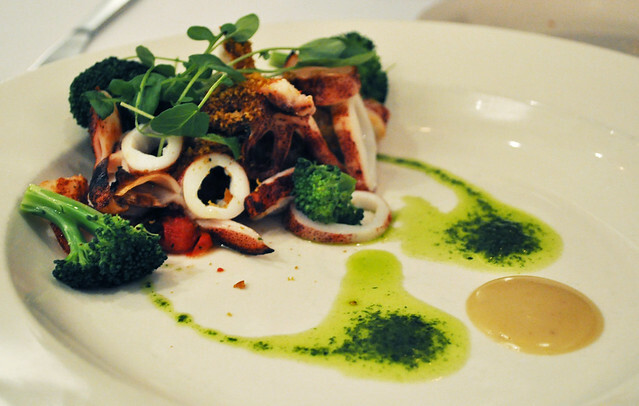 The plating of the dish was quite pretty and colorful, and we were ready to dive in. However, despite our initial excitement, there was something missing from the dish, that is, something to make the entire dish more cohesive and unified. I may have glimpsed at the rest of the dish's description too quickly to notice the stuffed sausage part. I thought there would be sausage mixed in with the remaining ingredients in the form of a risotto -- not the risotto inside a sausage with the accompanying ingredients. When we cut through the stuffed sausage, the interior was extremely crumbly and broke apart really easily, posing difficulties for scooping up and eating. Fortunately, the flavor of the curry risotto matched with the remaining ingredients proved to all be very robust, and the grilled squid was soft and delectable. The selection of ingredients was great, but their execution was lacking for me. 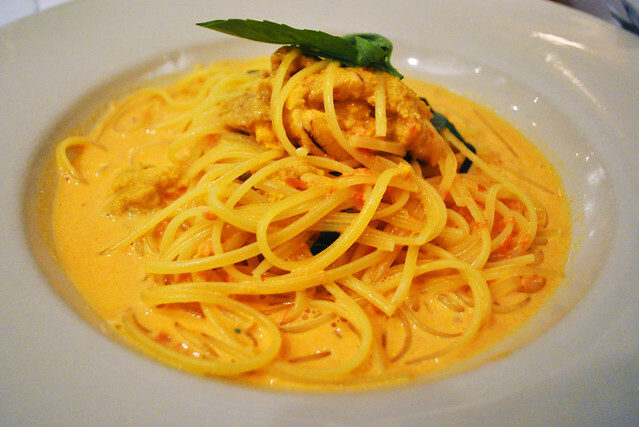 For my main course, there was that one pasta dish on the menu that was screaming my name -- the linguine ai ricci di mare: linguine with fresh sea urchin and basil in pink sauce. I didn't see any cream (though I assumed there would be some) or cheese in the dish's description on the menu, so I thought I'd be okay on the conservative dairy front. So when it arrived, it appeared as if it was super creamy and sprinkled with some Parmesan, but luckily, I was mistaken. The cream was very light and easy to digest, and what I mistook for cheese was in fact lobes of sea urchin roe. The linguine was a buttery al dente, gently swimming in a delicious pink sauce of the lightest creaminess. The generous helping of sea urchin added a balancing textural contrast as well as a tinge of briny flavor to the rest of the dish -- each slurp of linguine melted in my mouth. Needless to say, I was sad to see this dish go -- it was so good! 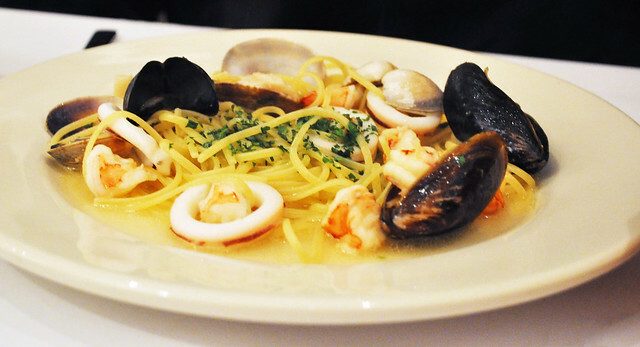 Marcus had the linguine alle pescatore -- linguine with clams, mussels, shrimp, squid, and sea scallops. A simple preparation with well cooked sea fare can go a long way -- the seafood made the linguine dance in its butter sauce. The sheer variety of things mixed in with the linguine made Marcus a happy camper. 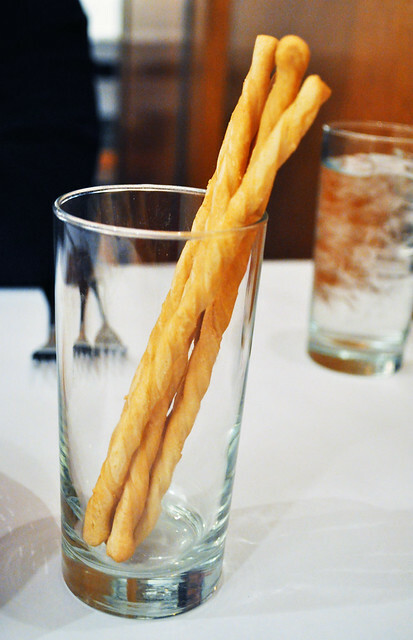 Findings: All in all, I found Basta Pasta to be a lovely date night spot. The restaurant's lighting proved to be a godsend for my photographs, and the low ambient chatter makes for effortless conversations that don't require a couple to holler at each other just to be heard over loud music and even louder neighboring tables.Its white interiors are calming and serene and also allow for the restaurant's vibrantly delicious dishes to pop. Although I was expecting the menu to be a bit more Japanese inspired (I found most items on the menu had only very subtle hints, if any, of Japanese ingredients and perhaps not completely obvious Japanese culinary techniques), the execution of their dishes were still very well done -- all very sleek, subtle, and simple in presentation and flavor. I found the lingine ai ricci di mare to be perfect, especially with its well-balanced consistency of the cream sauce with the pasta. Perhaps it's the subtlety and delicateness that Basta Pasta is aiming for, contrasting against the robustness of most Italian cooking. Price point: $13 for each antipasti, $20-23 for each primi piatti.